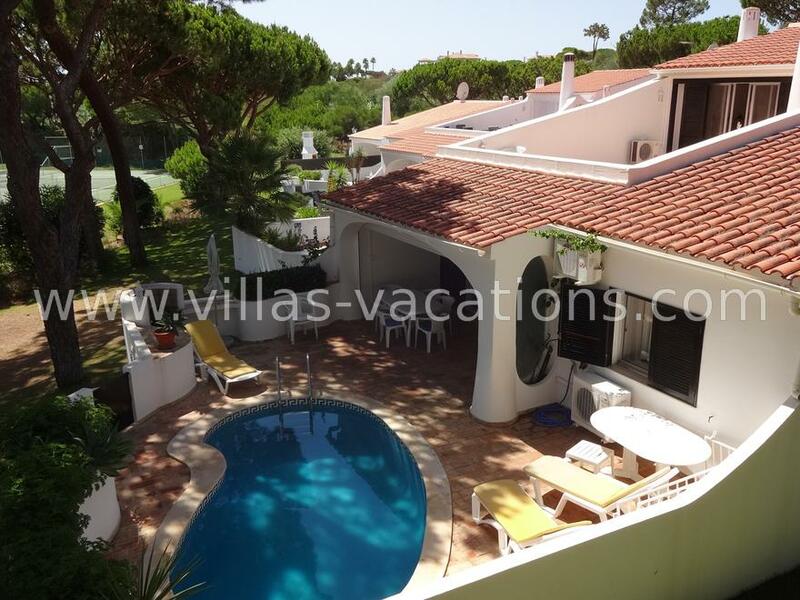 This three bedroom linked townhouse with plunge pool is conveniently situated behind the Vale do Lobo Tennis Centre. Ground floor: Entrance hall with guest WC. Spacious lounge/dining area with TV, video and stereo, dining table to seat 6. Patio doors to partly covered private terrace overlooking tennis centre with patio furniture. Plunge pool and built-in BBQ. For families with young children, a pool fence can be provided with prior request. Fully fitted kitched equipped with microwave, electric hob with extractor, oven, dishwasher and washing machine. Door to outside enclosed terrace/laundry drying area. Two twin bedrooms with fitted wardrobes, carpeted floors sharing a bath/shower room. Stairs to first floor master twin bedroom with fitted wardrobes, full ensuite bathroom and patio doors to large sunny private terrace with patio furniture and views to the tennis centre and resort. Maid Service included 2 times per week (except during weekends and Public Holidays). Air-conditioned throughout, WIFI internet facility. Approximately 20 - 30 minutes walk to the beach and 'Praça' with shops, bars and restaurants. 25 minutes drive from Faro Airport.